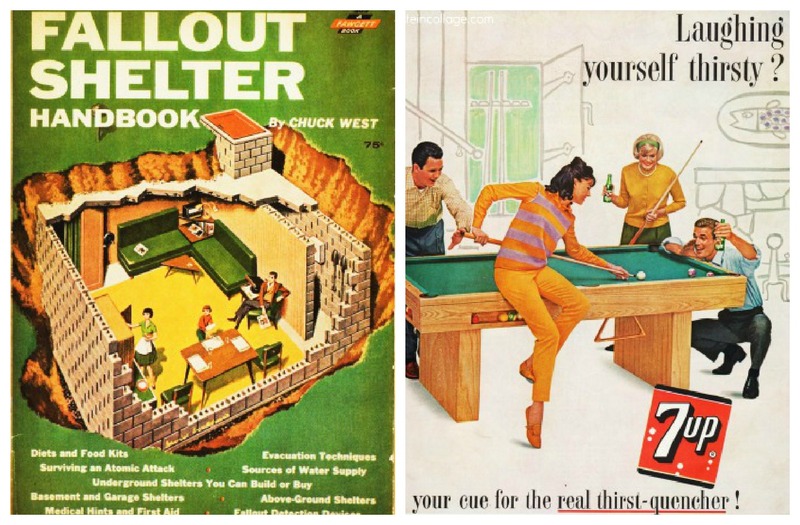 The vintage Fallout Shelter Handbook by Chuck West depicts the Concrete Block Shelter so popular with smart suburbans. The interior looks as fresh and modern as any 1960s suburban home. 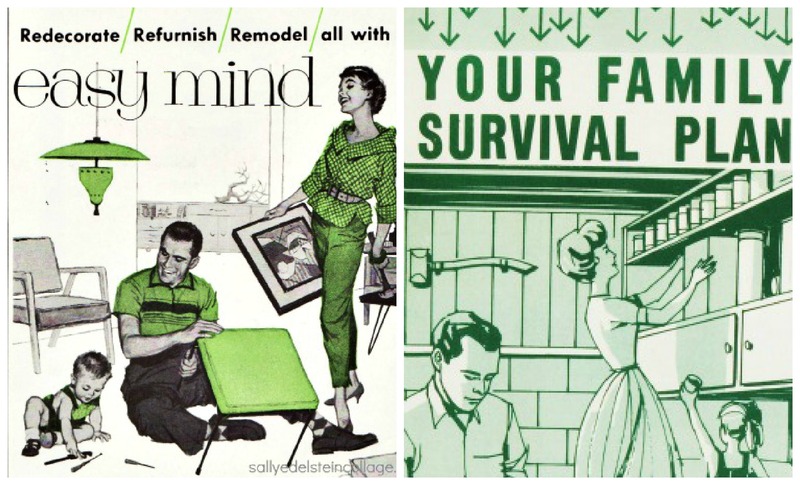 The first cracks in my mid-century American dream appeared some 50 years ago this summer. 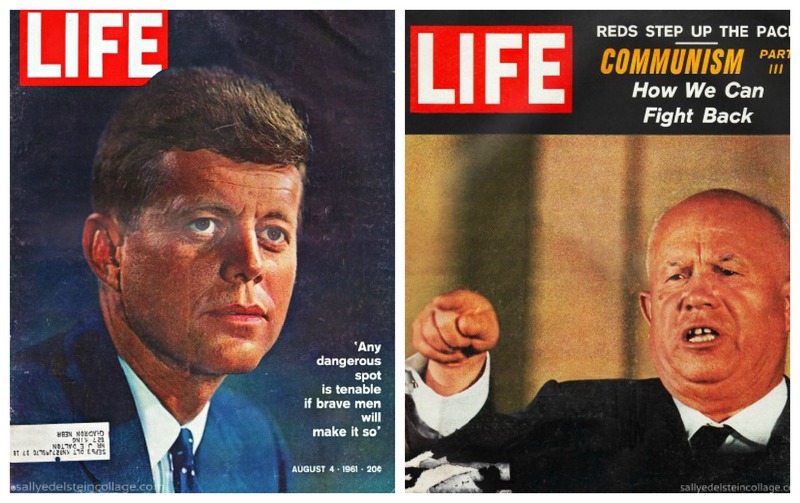 Raising the heat of the Cold War a tense President Kennedy appeared on National television 51 years ago this week urging Americans to build fallout shelters in event of a possible thermonuclear war. July 25th 1961 started out ordinary enough. After an exhausting rainy day of refereeing my brother and me and our countless clashes, Mom rolled the portable TV set into her bedroom that Tuesday evening, hoping for a bit of distraction from the strain of the stormy day. Adjusting the antennae that zipped out oh-so-easily from the “scano-tenna’ handle, she was grateful that the new TV set miraculously eliminated interference caused by appliances, automobiles and anytime a neighbor used his power drill; if only, she cracked to Dad, it would help block out the interference from their two children. Mom could have used the comic relief provided by Red Skelton to help her unwind; his silly slapstick usually held the 10 o clock time slot, but she was content to watch his summer replacement -“The Purex Special for Women”. Decades before the airing of Americas dirty laundry became the norm, this highly acclaimed series of soapy pseudo docudramas geared to the housewife dealt with intimate topics rarely talked about on television or anywhere else for that matter. Checking the TV Guide listing, Mom noted with interest that tonight’s explosive installment was entitled: “The Cold Woman” starring a hot Kim Hunter as a frigid woman. In just the past few months JFK had taken some serious blows to his formidable self-confidence. After the fiasco of botching the Bay of Pigs invasion in April, our young president was plagued with self doubts. And in June, a jet setting JFK had returned shaken not stirred from his Vienna summit with Khrushchev who smugly assumed he was dealing with a novice, leaving many Americans troubled by JFK’s lack of gravitas and inexperience in handling a hot crisis . Temporary Basement Fallout Shelter built from Civil Defense plans. The structure was based on the same plan as the Concrete Block shelter but was constructed with less permanent materials. The walls were made of stacked wood and sandbags to provide shielding against radiation. Do I feel a headache coming on? Mom and Dad watched tensely as a grim get-tough JFK spoke to us live from the White House in his own version of a fireside chat. Though handsome as any movie star, Mom noticed his face appeared puffy, his hands seeming to tremble slightly as he shuffled papers in front of him. But there was no tremor in his voice as he somberly spoke about the developing crisis in Berlin. The city divided up between the victors of WWII was located deep in the Soviet occupied parts of Germany and now the Soviets were threatening to drag it behind the Iron Curtain. Looking right into the camera, he relayed some chilly news. Berlin was in an uproar, and hinted it could mean war- and thermonuclear war at that. In a take it or leave it brusqueness, a volatile Nikita Khrushchev, Kennedy informed us, had cold bloodily boasted that USSR thermonuclear strength was unmatchable, and could leave America in a cloud of radioactive dust. 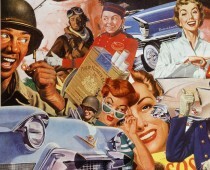 The President laid it on the line that we were ready to fight if forced to, urging Americans to build bomb shelters. Citizens should be ready to protect their own families. Shuddering at the ominous tone I absorbed it all. For those who remembered war and those who like me at six years old merely heard of it, the president’s speech was 31 minutes of hard-hitting, sobering talk. Suddenly it seemed, my safe suburban backyard with its styled-for-comfort-ease-of -living could flare up in flames. The next morning neighbors spilled out from their stuffy split levels after a collective case of cabin fever. Do-It- Yourselfers were out in full force once again tackling half completed projects egged on by nagging wives. One neighbor prudently eyed a pallet of bricks once slated for a built-in barbecue was now re-evaluating their use for the more practical construction of a fall out shelter instead. As others were thinking the unthinkable, I tried not to think.